JAVA Certification Course Online: Most of Institutes offers Java technologies and JAVA Certification Courses for beginners, preparing individuals for a successful entry into the programming world. Java Certification Training Course provides a comprehensive training that includes fundamentals of Java programming. Java Course is ideal for application developers who would like to gain expertise in creating rich Java applications. 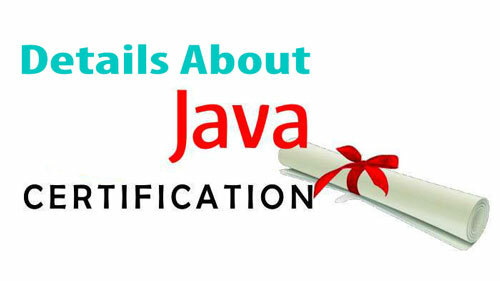 Here’s JAVA Certification Details like Eligibility Criteria, Cost, Validity, Salary, Online Courses, Training, etc available. JAVA is a programming language that developers use to create applications on your computer. Nowadays, Java is one of the most preferred software platforms for running modern applications. Java applications can run on any device and billions of devices are already running it worldwide. Java courses are divided into three levels: Basic Level, Intermediate Level and Advance Level. Java was taken over by Oracle in 2010, so its certifications are now governed and provided by Oracle Inc. In order to prepare and pass these certification exams, you would require sufficient level of understanding of respective Java technologies. Oracle Certified Associate (OCA): This is First level of certification indicating a good basic understanding of the language. Oracle Certified Professional (OCP): A benchmark for professionals in the field of java programming. Earning this certification will take your Java career to next level. Oracle Certified Expert (OCE): Expert level certifications are to test the knowledge on any special areas in Java EE technology. The following are the list of certification under OCE level. Oracle Certified Master (OCM): This is the final level of certification in the Java certification path. These Oracle Java Certification exams, which were earlier known as Sun Java Certification exams and it focuses on key job roles in software application. Sun Certified JAVA Programmer (SCJP) Course Duration is 2 Months. Salaries for this field can vary based on location, qualification/experience, employer as well as employment type. Few job roles and salaries are as follows. Certificate Course in Java Technologies are valid until there version remains valid.